Lovely, delicious peaches (Prunus persica) with their soft skin, sweet flesh and pleasant aroma are widely popular and versatile summer fruits with variety of health benefits. This perfect summertime snack food for losing weight is low in calories, contain no saturated fat or cholesterol, a good source of dietary fiber and packed with numerous health promoting compounds, minerals, and vitamins. Peaches are naturally sweet and have to be consumed in moderation, because high intake of fructose can be harmful. Why peaches have fuzzy skin? Fuzzy, velvety peaches with their delicate yellowish pulp and wide range of health benefits are going to help you with: gout, rheumatism, bronchitis, coughs, gastritis, breast cancer prevention, diabetes, ischemic heart diseases, eye health, oral cavity cancer prevention, high blood pressure, weight management, pneumonia, diarrhea, cholesterol levels, Alzheimer’s disease, kidney stones, heart attack and strokes prevention. Since peach skin is so thin and delicate, there is a theory that they need added layer of protection. Theory suggests that those fuzzy hairs act as an irritant to destructive insects, and as a shield from light rain and dew. Donut peach (Prunus persica var. platycarpa) also known as Saturn peach is a smaller variety of peach with a distinguished shape. Saturn peach is more flat than round and it has resemblance to doughnut or rings of Saturn. Peach seed is large, oval in shape, and contains hydrocyanic acid which is a poisonous substance in a bigger amount. But don’t worry, you are not going to eat them by mistake, because they are protected with woody husk and they doesn’t taste too good. It’s important to eat a balanced diet and to maintain healthy lifestyle during and after breast cancer, one of the most common malignancy in Western societies. Research has found that regular consumption of polyphenols, an abundant micronutrient found in peaches, is helping breast cancer survivors and they have lower relapse rates. Peaches can’t prevent you from getting breast cancer but they can make your body the healthiest it can be and reduce your risk of development or progression of breast cancer. Serious health condition known as metabolic syndrome is a cluster of conditions such as hypertension, high blood triglycerides, high cholesterol, and impaired glucose tolerance, that put you at risk for heart disease and diabetes. The good news is that stone fruits like peaches have a unique combination of bioactive compounds that can potentially prevent, control, or even reverse metabolic syndrome. Gastrointestinal (GI) motility refers to system that is responsible for digestion, the movement of food throughout our body. Motility problems include heartburn, non-cardiac chest pain, chronic constipation and incontinence. Extract of peach flowers may help regulate irregular contractions in the GI tract and maintain their proper function. 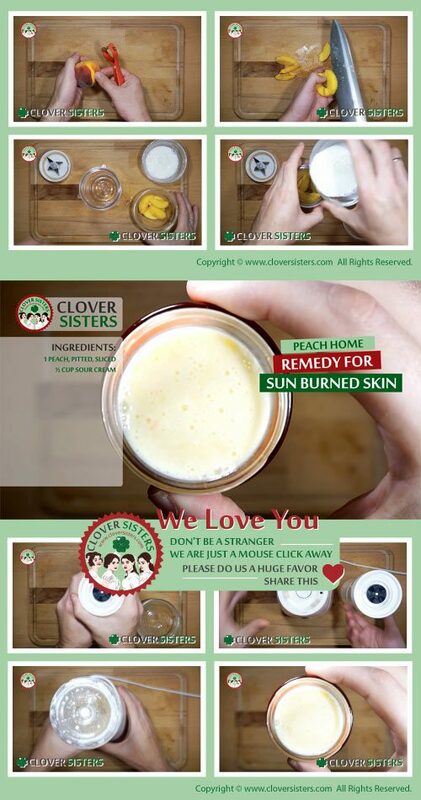 Blend 1 peach and 1/2 cup of sour cream together and apply on sun burned skin to get immediate relief. Apply repeatedly if needed. Wash it off normally.